Tickets will be available at the door and early arrival is strongly suggested. Advance tickets are no longer available for this show. Table service is available, please email VIP@avalonhollywood.com to reserve. 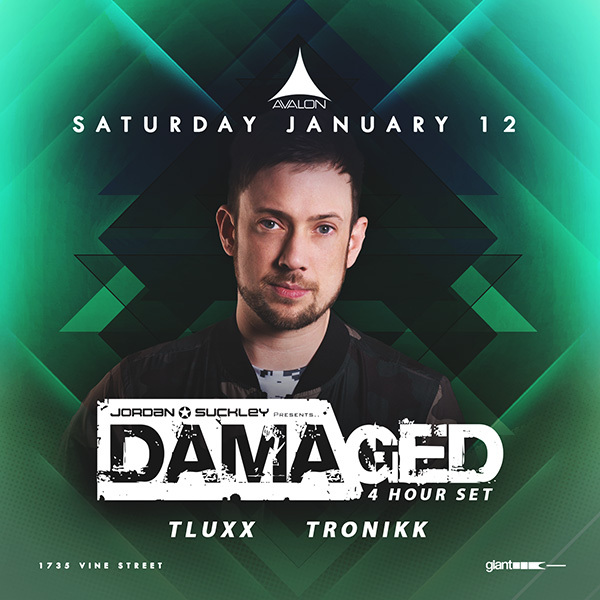 AVALON Hollywood is proud to bring back Trance favorite Jordan Suckley on Saturday, January 12th, for an extended four hour set! From an early age of 18 while attending university in Liverpool, Jordan won a DJ competition that let him play a gig at one of the clubs Cream, he hasn't stopped since. After being picked up in 2009 by Black Hole Recordings, he has been on a rampage of touring around the world. With label releases ranging from ‘Damaged Records’ & ‘Subculture’ you are sure to be familiar with the Jordan Suckley sound. He has done major remixes for Tiesto, Armin Van Buuren, Paul Oakenfold and the list of superstars goes on. Straight off an Australia tour as well as coming back to the U.K as 3Fect one of his alias,he is sure to bring the firepower to the decks. Providing warm up duties will be none other than TLUXX and TRONIKK. 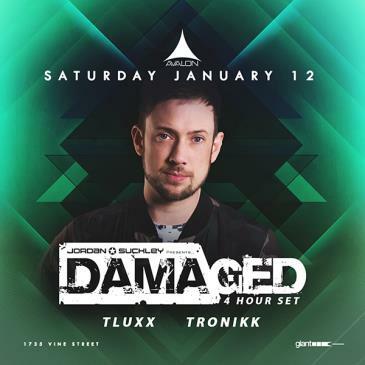 Be sure to be ready for a journey through music when Jordan Suckley comes back to Avalon Hollywood for this incredible Extended Set Saturday, January 12th. Upscale casual. Management reserves the right to refuse entry for any reason. No beach clothing, shorts, sandals, sporting attire or baseball hats. NO PARTY BUSES! Party Bus Occupants will be denied entry. AVALON does not condone or tolerate Mosh Pits. Anyone found to be instigating or participating in a Mosh Pit will be subject to eviction from the venue. Ticket(s) purchased via this website may be claimed at the WILL CALL desk at AVALON only on the night of the event. Please bring the credit card used to purchase the ticket(s) along with a valid PICTURE ID documenting that you and your guest(s) are at least 21 years of age. TICKETS MUST BE CLAIMED BY 11PM to guarantee IMMEDIATE ADMISSION. We will hold space for everyone who claims their ticket(s) before 11PM. WHAT HAPPENS IF YOU ARRIVE AFTER 11PM? After 11PM, we can no longer limit capacity for you and we will start admitting general admission guests up to our capacity. If you arrive after AVALON has reached capacity, you will be given PRIORITY ADMISSION. Once AVALON reaches capacity, those holding ticket(s) will be admitted before those in the general admission or guest list lines, but you must wait for people already admitted to leave the club to reestablish available capacity. WHAT IF TICKETS FOR A SPECIFIC EVENT ARE SOLD OUT? We only sell 50% of our capacity in advance for each event. If you do not have a ticket, we strongly suggest arriving by 10PM for your best chances of getting in. All sales are final and you must agree to all the terms as outlined above and in the Terms of Purchase agreement on this form.